The overall theme of the Pacak research program is the study of disorders that affect mitochondrial function. While the program is focused on the investigation of specific rare diseases – Barth syndrome (BTHS), Cockayne syndrome (CS), and Pyruvate Dehydrogenase Kinase 4 deficiency (PDK4) – we apply mechanistic knowledge gained from these studies to broader concepts such as the role of mitochondria in cardiac dysfunction and neurodegeneration that are highly relevant to many common health disorders. Dr. Pacak first became interested in research while completing her undergraduate honors research thesis project in Dr. Mark Seeger’s CNS development laboratory at Ohio State University. After graduation, she was introduced to AAV while working as a vector laboratory technician for Dr. Reed Clark and Dr. Phillip Johnson at Nationwide Children’s Hospital in Columbus, Ohio. This experience inspired her to pursue graduate studies in an AAV laboratory. She earned her Ph.D. in 2006 from the University of Florida Interdisciplinary Program in Biomedical Sciences under the mentorship of Dr. Barry J. Byrne. Her thesis focused on the development of AAV-mediated gene delivery for heart and skeletal muscle. 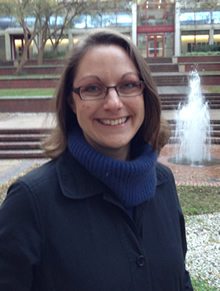 She then completed a postdoctoral research fellowship at Boston Children’s Hospital and Harvard Medical School under the mentorship of Dr. Douglas B. Cowan where she worked on developing a biological replacement for pacemakers in children with atrioventricular block using muscle-derived cardiac progenitor cells and mitochondrial transplantation therapies. In early 2014 Dr. Pacak returned to UF as an assistant professor in the Department of Pediatrics. Saha M, Mitsuhashi S, Jones MD, Manko K, Reddy HM, Bruels C, Cho KA, Pacak CA, Draper I, and Kang PB. 2017. Consequences of MEGF10 deficiency on myoblast function and Notch1 interactions. Human Molecular Genetics. 26/15: 2984-3000. Kathryn Taggart, Amara Estrada, Patrick Thompson, Francisco Lourenco, Sara Kirmani, Silveli Suzuki-Hatano, and Christina A. Pacak. 2017. PDK4 Deficiency Induces Intrinsic Apoptosis in Response to Starvation in Fibroblasts from Doberman Pinschers with Dilated Cardiomyopathy. Biores Open Access. 6: 182-191. Pacak CA, Preble JM, Kondo H, Seibel P, Levitsky S, Del Nido PJ, Cowan DB, and McCully JD. 2015. Actin-dependent mitochondrial internalization in cardiomyocytes: evidence for rescue of mitochondrial function. Biology Open. 4/5: 622-626. Bartholomä MD, Zhang S, Akurathi V, Pacak CA, Dunning P, Fahey FH, Cowan DB, Treves ST, and Packard AB. 2015. (18)F-labeled rhodamines as potential myocardial perfusion agents: comparison of pharmacokinetic properties of several rhodamines. Nuclear Medicine and Biology. 42/10: 796-803. Hammer PE, Pacak CA, Howe RD, and del Nido PJ. 2014. Straightening of curved pattern of collagen fibers under load controls aortic valve shape. Journal of Biomechanics. 47/2: 341-346. Masuzawa A, Black KM, Pacak CA, Ericsson M, Barnett RJ, Drumm C, Seth P, Bloch DB, Levitsky S, Cowan DB, and McCully JD. 2013. Transplantation of autologously derived mitochondria protects the heart from ischemia-reperfusion injury. American Journal of Physiologyl Heart and Circulation Physiology. 304/7: H966-982.